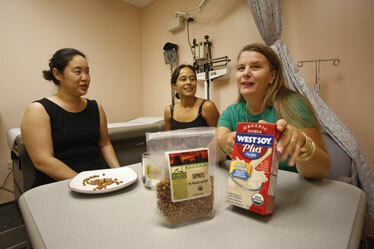 Research nutritionist Shana Suzuki, project coordinator Vickie Ramirez and breast cancer study participant Elizabeth Martin were involved in a study at the Cancer Research Center of Hawaii to see whether high soy consumption decreases the risk of breast cancer. Martin holds a box of soy milk, a product she frequently consumed for the study. Elizabeth Martin grew to like soy milkshakes as a participant in a Cancer Research Center of Hawaii study to see whether eating soy foods prevents breast cancer. Call 586-2997 for more information about a study by the Cancer Research Center of Hawaii to see whether eating soy foods prevents breast cancer. Since ending the study, Martin said she enjoys regular milk, but "I'm back to making my shakes in the morning with soy milk. It's good for me and I like it." The 41-year-old started the study in August 2007 and completed it last month, she said. Her aunt was diagnosed with cancer in April 2007, while she was considering the study, and died in November, she said. "It wasn't breast cancer, but it made it real to me," Martin said. "I thought if I could be of help to the study, maybe it would help somebody in the future." Pre-menopausal women between ages 18 and 50 who are not on any hormones, including birth control, are sought for the Hawaii study. Project coordinator Vickie Ramirez said she signed up 65 women out of 240 screened for the 13-month Breast, Estrogen and Nutrition study. Six have completed it and 20 are in the process. She is still recruiting in hopes of getting a total of 120 participants. Many potential candidates are weeded out because they want to get pregnant in the next year or they do not meet other qualifications, she said. Soy contains biochemicals called isoflavones, plant-derived substances structurally and functionally similar to estrogen. Because of that, it is believed isoflavones are able to bind to the estrogen receptor and exert estrogenlike effects, Ramirez said. Ramirez said several epidemiological studies suggest a decreased risk of breast cancer in women from countries with high soy consumption. "These studies support the idea that soy foods may protect against breast cancer," she said. "Our hypothesis is that an increase in consumption of soy foods and isoflavones will lead to lower estrogen levels in the breast tissue. We're trying to see if we see isoflavones in breast fluids, urine and blood when they're on a high soy diet, and again on a low soy diet, to see how they differ." Breast fluid is collected from each participant seven times over the 13 months for comparisons of isoflavones during high and low soy periods, she said. It is done with a pump similar to that used during breast-feeding. It is not painful, but it prevents some women from joining, she said. During the first six months, participants are required to eat soy foods twice a day. "They gave me a card to buy tofu and gave me soy nuts and soy milk," Martin said. The foods can be mixed, but she did not care for soy nuts so she chose soy milk, making a shake every morning for both servings, she said. "It was easiest for me. I think I missed one day out of six months." After the first six months of high soy consumption, one month is allowed for a "washout period" with no soy products, Martin said. Then she had to avoid soy products for six months as much as possible. "If you eat a little tofu, it's not going to hurt."